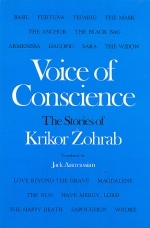 Voice of Conscience is a collection of seventeen short stories penned by Krikor Zohrab, the Zohrab Center’s namesake and the renowned Armenian politician and writer. Originally published in 1909 in Constantinople, this critical piece of Armenian literary history can now reach millions of new, potential readers thanks to Jack Antreassian’s skillful English rendering. A true realist in style and form, Krikor Zohrab gives valuable, sometimes startling, insight into the daily lives of Armenians living in the Ottoman Empire at the end of the nineteenth century through the stories in his collection. This intriguing period of social and cultural renaissance, often overshadowed historically by the devastation that brought it to a sudden and irreparable end, produced exceptionally fertile ground for his literary imagination and an almost endless supply of conflict and paradoxes to explore. The themes of this collection encompass a very wide range. Light-hearted tales of young love like Rehan are placed immediately after The Black Bag, a grim story of desperation that reveals the psychological toll of financial hardship and mere pages from Armenissa, a window into the seemingly intransigent religious divisions that afflicted the Armenian community at that time. Other stories in the collection address issues of class and religiosity as well as the pain of personal loss and the evolving role of women. This striking variation in subject matter is a testament to the vitality of the Armenian community during this era and helps contemporary readers more accurately visualize the various facets of Armenian life during this vibrant, yet precarious, period in Armenian history. The Zohrab Center currently has two copies of Voice of Conscience that it would be more than happy to give to enthusiastic readers. If interested, please stop by or contact the center at zohrabcenter@gmail.com.